Friday, September 2. 6 pm – 9 pm. Festivals of Aloha, Maui Kick Off at Wailuku First Friday. The annual Festivals of Aloha is celebrated on all the islands, with parades, concerts and cultural activities. The opening event for Maui will be part of the Wailuku Town’s First Friday Party. Saturday, September 3. 10 am – 4 pm. 3rdAnnual Keokea Ho’olaulea. Crafters, music, hula, keiki tent, farmers, and local food. Keokea Marketplace. Saturday, September 3. 10 am – 1 pm. 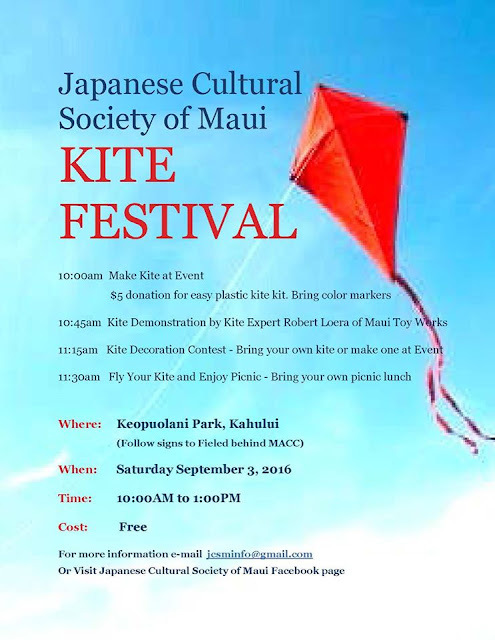 Japanese Cultural Society of Maui Kite Festival. Make a kite or bring your own, learn to fly it better, decorate it. Bring a picnic lunch. Free or $5 to buy a kite making kit. Keopuolani Park, Wailuku. Sunday, September 4. 7:30 am – 9 am. Maui Electric Company’s Keiki Tilapia Fishing Tournament. For keiki 2 – 18 years old. Royal Kaanapali Golf Course. $20. Thursday, September 8 – Sunday, September 11. 6th Annual Maui Jazz & Blues Festival at various locations across Maui. Friday, September 9. 5 pm. Blessing & Opening of Malama Wao Akua Juried Art Show. This annual art show highlights the native species of Maui, from mountain to sea. Worth seeing. Hui No’eau Visual Arts Center. Saturday, September 10, 8 am – 12 noon. Provisions Workshop: Whole Hog Butchery with Malama Farms. Provisions chef Gary Johnson, trained butcher Morgan Maki and farmer Dave Fitch will provide a whole hog butchery workshop and lunch. Hana Ranch Provisions, Paia. $85. Saturday, September 10, 5 pm – 9 pm. Kokua for Kupuna, A Benefit for Hale Makua Health Services. Traditional luau feast under the stars with entertainment by the Makaha Sons and Halemanu. Silent auction. Sheraton Maui, Kaanapali. $140. Saturday, September 10. 5:30 am – all day. Hana Relay. One of the most popular runs of Maui – teams relay race from Kahului to Hana, often wearing colorful themed costumes. A lot of fun to watch along Hana Highway, even if you don’t participate. Online registration is closed, but you may find last minute teams on the Facebook group. Saturday, September 10. 5:30 pm – 9 pm. Olive Oil: Tapping the Tree Cooking Class. Make some wonderful dishes with Chef Lee: infused olive oils, olive oil poached shrimp, caprese salad, sun dried tomatoes with pasta, classic roasted chicken, grilled steak, lemon olive oil cake, chocolate mousse. 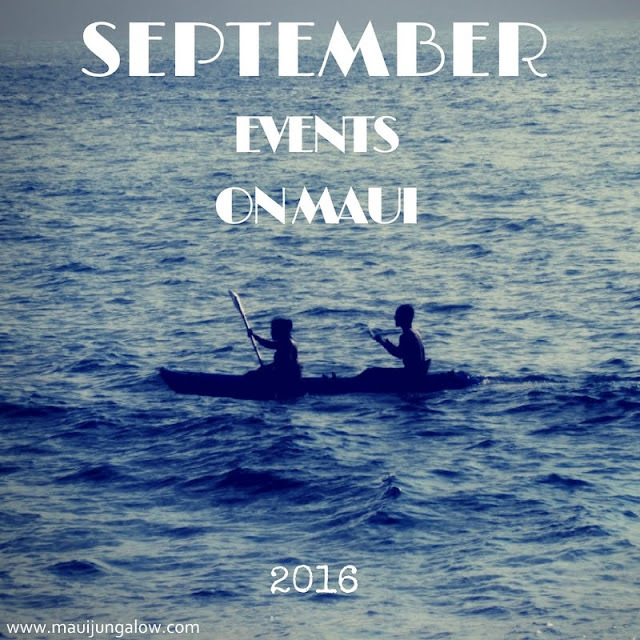 Sugar Beach Events, Kihei. $95. Tuesday, September 13. 6 pm – 9 pm. Wooden Crate Cabaret at Lumeria with Joe Louis Walker. The Wooden Crate Cabaret and the Maui Jazz and Blues Festival hosts Joe Louis Walker for an intimate evening of blues music. Wooden Crate’s Chef, Ben Diamond, will serve a three course organic garden to table meal with ingredients foraged from the Lumeria garden and neighboring farms. Makawao. $125 Per Person, BYOB. Friday, September 16. 6 pm – 8 pm. Festivals of Aloha, Aloha Friday Night at Queen Ka’ahumanu Center. Festivities continue on Maui. FREE! Friday, September 16 and Saturday, September 17, 10 am – 7 pm. The Chinese Moon Festival celebrates Maui’s agricultural harvest during this traditional Chinese Moon Festival. Chinese tea and moon cakes will be served, erhu performance, fan dance and lantern dance both evenings. Farmers Corner Market, craft activities like seed planting and lantern making, feng shui talk, and Chinese cuisine for sale. Wo Hing Museum, Lahaina. FREE! Saturday, September 17 – Sunday, September 18. 9 am – 5 pm. Festivals of Aloha, Maui Nui Style – Ho’olaulea. A day filled with Hawaiian music, hula, crafters and artisans. Historic Banyan Tree Park, Lahaina. FREE! Saturday, September 17. 8 am. Pailolo Challenge. This 26 mile downwind canoe race from D.T. Fleming Beach on Maui to Molokai is considered the “The World’s Funnest Canoe Race.” Participants travel from all over the world to compete. Free to watch. DT Fleming Beach, West Maui. Sunday, September 18. 5 am shotgun start. JTB Maui Marathon & Half Marathon. 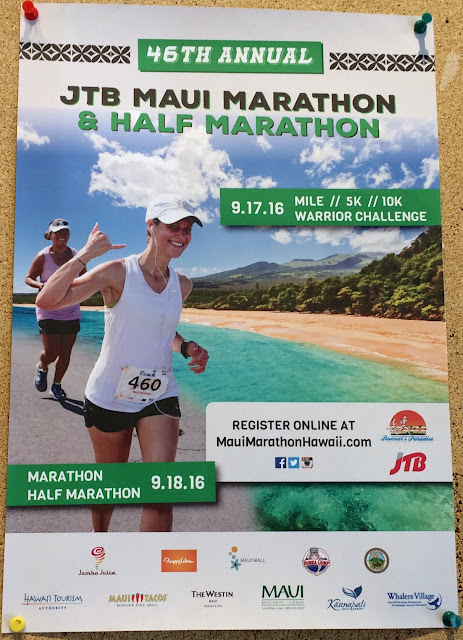 This marathon is considered one of the 10 most scenic marathons in the US and goes from Kahului to Ka’anapali. Shorter races this day include the Slappy Cakes 10k, Maui Tacos 5k, and Bubba Gump Shrimp Co. Front Street Mile. Kahului to Ka’anapali. Saturday, September 23. 6 pm – 9 pm. Richard Ho’opi’i Leo Ki’eki’e Falsetto Competition showcases Maui’s premier amateur male falsetto singers. The male falsetto art form developed when Hawaiian women were forbidden to sang publicly. Part of the Festivals of Aloha for Maui. King Kamehameha Club House, Wailuku. Saturday, September 24, 10 am – 3 pm. Maui Okinawan Festival. Details TBA. Maui Mall, Kahului. Saturday, September 24. 7 am. Maui Walk to End Alzheimer’s. This 3.2 mile walk raises funds for Alzheimer’s support, care and research. Boys and Girls Club – Central Clubhouse, Kahului. Saturday, September 24. 8 am. Hale Kau Kau 1st Annual Walk to Stomp Out Hunger 5K & 1K Walk. This walk raises funds for Hale Kau Kau’s programs. St. Theresa Church, Kihei. Saturday, September 24. 5:30 pm – 10 pm. Fur Ball 2016: Paws Vegas by the Maui Humane Society. Prime rib buffet (vegetarian options available), Vegas style “casino,” silent auction, dancing and music. King Kamehameha Golf Club, Wailuku. $125. Saturday, September 24. 5:30 pm. American Cancer Society – Hope Fest Neon Ball. This event will help raise funds to build the Hope Lodge Maui, a home away from home for cancer patients and their caregivers. Features live music, dinner, dancing, silent auction, live auction, and other fun. Andaz Maui, Wailea. $195. Friday, September 30. 6 pm– 8 pm. 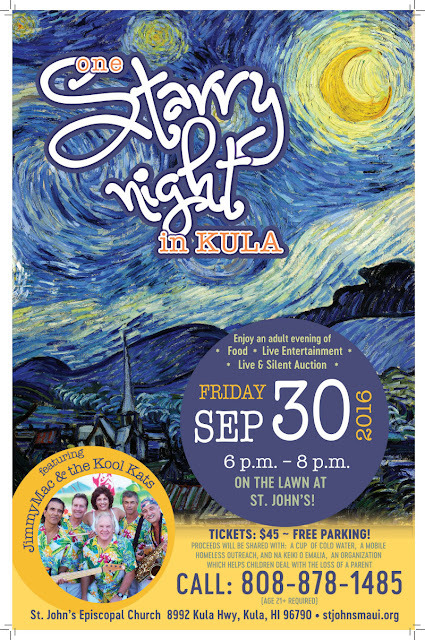 One Starry Night in Kula – part of the St. John’s Kula Festival. A fun evening event with live and silent auctions, wine tasting, generous appetizers, and entertainment under the stars. $45. St. John’s Episcopal Church, Kula. Saturday, October 1. 9 am – 4 pm. St. John’s Kula Festival. This popular upcountry festival includes entertainment, food, plant sale, craft sale, quilt show, silent auction, and fun for the kids. St. John’s Episcopal Church, Kula. $1 entry. Sunday, October 2, 1 -6 pm. Maui Ukulele Festival. Enjoy listening to some of Hawaii’s finest ukulele players at this annual festival. MACC, Wailuku. FREE!